The past year may well go down as one of the most transformative in the reverse mortgage industry since the program began in the late 1980s. The Department of Housing and Urban Development rolled out a series of sweeping changes to the Home Equity Conversion Mortgage, multiple major players began looking beyond the HECM for revenue, and others struggled with regulatory issues. But there were also signs of hope for reverse mortgage professionals, with HUD’s new secretary emerging as an advocate for the HECM program, the much-maligned certificate-of-occupancy rule amended, and various parties in the industry coming together to help an influx of potential borrowers ahead of the change to principal limit factors in October. So as we approach Christmas and New Year’s, let’s take a look back at the biggest stories from 2017. HUD to Raise Premiums, Tighten Limits on Reverse Mortgages — Far and away the most-read story in 2017, HUD’s decision to lower principal limit factors and restructure mortgage insurance premiums shook the industry and created a mad dash among lenders and counselors as borrowers sought to lock in the higher rates before the October 2 deadline. The move also raised questions about the ongoing stability of the federally backed reverse mortgage program, as HUD blamed a grim 2016 actuarial report for the limit cuts — and that was before the fiscal 2017 report showed an even worse financial value for the HECM portfolio. Ocwen to Shell Out $56 Million in Class-Action Settlement — Ocwen Financial Corporation (NYSE: OCN) had a rough 2017, with multiple regulatory issues across several fronts. But the one that generated the most interest from RMD readers was this hefty settlement stemming from problems in its 2013 and 2014 financial statements, as well as a 2014 consent decree that prevented it from picking up mortgage servicing rights in New York State. What HUD’s New Rules Mean for the Reverse Mortgage Industry — RMD took readers inside the ramifications of lower principal limit factors, including the disappearance of the rate “floor” at 5.06%, slower line-of-credit growth, and lower lender margins. The exact effects of these changes remains to be seen, however, as endorsement data still has not yet caught up with the October surge. HUD Finally Issues Long-Awaited Program Changes for Reverse Mortgages — It might seem like far longer than 11 months ago, but HUD also solidified the HECM final rule in January, bringing a range of other changes to the program in a year that would see plenty — including a requirement that lenders must explain all Federal Housing Administration-insured reverse mortgage products to potential borrowers, and a provision allowing sellers to pay certain fees in HECM for Purchase transactions. Walter Shuts Down RMS, S1L Reverse Mortgage Originations — Walter Investment Management Corporation (NYSE: WAC.BC) kicked off the year by leaving the reverse mortgage origination space entirely, shutting down its Security One Lending channel and converting Reverse Mortgage Solutions into a servicing-only entity. The move was just the start of a rough year for the financial services company, which filed for Chapter 11 bankruptcy protection last month; RMS will remain out of the court-sanctioned restructuring plan. These stories may not have been the most read, but they were certainly among the most interesting to research and write. 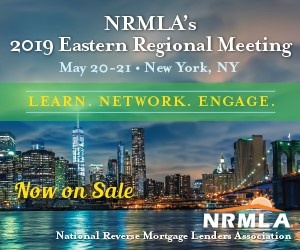 Hangin’ with Mr. Cooper: Nationstar to Change Name in August — Its Champion reverse mortgage brand may remain intact, but Nationstar Mortgage Holdings, Inc. (NYSE: NSM) underwent a reinvention as “Mr. Cooper” this year — with the goal of putting a friendly face on the often cold, impersonal world of mortgage servicing. The company has personified itself as a friendly ally of its customers, though management also emphasized that any connection to the ‘90s sitcom starring Mark Curry was unintentional. Obscure Regulation Halts Reverse Mortgages, FHA Lending in Some Towns — RMD took you into the struggle between reverse mortgage lenders and homeowners’ associations in certain retirement communities in Arizona, where rules regarding mandatory dues upon title transfers were preventing the FHA from insuring HECMs or any other loans. Originators and homeowners wanted the associations to issue waivers; the associations largely said it was HUD’s problem, and that the department should provide new guidance about the issue. Senators Raise Questions About Reverse Mortgages and Trump Budget — President Trump’s proposed fiscal 2018 budget raised the eyebrows of Sen. Catherine Cortez Masto, a Nevada Democrat, and Sen. Marco Rubio, a Florida Republican. The pair sent a letter to HUD and White House budget director Mick Mulvaney — before his appointment to lead the Consumer Financial Protection Bureau — asking for a clarification, but the story proved that there’s bipartisan interest in protecting the HECM program in Congress. Why a Republican CFPB Director Might Not Reduce Reverse Mortgage Regulation — The ongoing battle over the CFPB director’s chair is still unresolved, but several experts told RMD that lenders shouldn’t exactly celebrate if Mulvaney, the president’s pick and longtime critic of the bureau’s enforcement power, emerges victorious. Gutting the CFPB’s complaint database and other consumer-focused initiatives could simply be too risky from an appearances standpoint, and the bureau itself remains staffed by legions of Obama-era appointees who still support its regulatory mission. One Reverse Rolls Out New Ad Campaign Without Winkler — The pitchman-focused advertisement, for better or worse, has become synonymous with nationwide reverse mortgage marketing, from Robert Wagner to Fred Thompson to Tom Selleck. But after One Reverse Mortgage spokesperson Henry Winkler was forced to bow out of promotional work amid his involvement in a new TV series, the company decided to test an ad campaign with no on-screen pitchman. Barring any last-minute news from HUD or a major lender, these stories represented the biggest headlines of the year — my first covering the reverse mortgage industry for this publication. I’d like to take a quick second to thank our readers, as well as all of those who’ve taken the time to speak with the RMD team over the past year. We couldn’t do it without your tips, insight, clarifications, and corrections, and I’m personally looking forward to continuing our great coverage into 2018 and beyond.